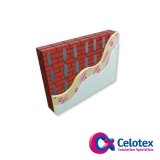 Celotex PL4000 is Celotex’s very own insulated plasterboard. Featuring Celotex’s world-renowned PIR board, this insulation is bonded to tapered edge plasterboard to create a plasterboard that’s easier and quicker to fit. The pre-existing insulation will contribute overall to the thermal performance of your build and the insulated plasterboard can be combined with further insulation in the partition wall. Celotex PL4000 is a tapered edge insulated plasterboard that can be installed using both dot and dab bonding as well as mechanical fix. When installing Celotex PL4000 insulated plasterboard you’re saving yourself time and money as both your plasterboard and insulation is being applied at one time. 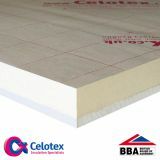 Applications are many for this insulated plasterboard as whilst this product is perfect for internal solid walls, insulating where you may not have been able to previously, you can also use Celotex PL4000 in pitched roofs, flat roofs, walls and timber frame linings. With thicknesses from 27.5mm to 77.5mm and thermal conductivity as low as 0.022 W/mK, Celotex PL4000 is sure to suit your project.